The Jeep Renegade made its debut in Geneva last month, but Jeep has brought the all-new small sport-utility vehicle over to New York to give us a closer look at the 2015 Jeep Renegade design, both inside and out. The 2015 Jeep Renegade exterior design builds from the Wrangler in terms of stance and body forms. 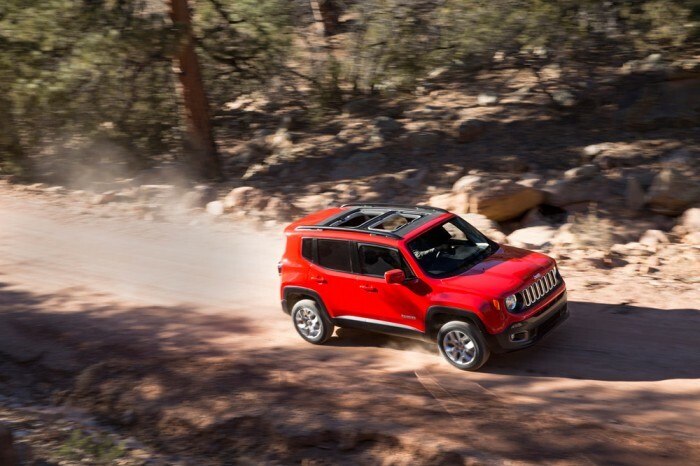 According to Jeep, the Renegade has best-in-class approach and departure angles to achieve best-in-class capability. The exterior is marked by a seven-slot grille and accent-colored “shield” surround and the signature large, circular headlamps. The Renegade sits on “beefy tires” and boasts door-mounted side mirrors, a lifted belt line, and a two-piece front fascia below the grille with body-color upper and molded-in-color lower for improved durability. The 2015 Jeep Renegade design also benefits from a blacked-out daylight opening and an available back roof option that, again, mirrors the larger Wrangler’s hardtop. In addition, the Renegade features the Jeep shield-shape tying in the rear backlight and square tail lamps (like—you guessed it—the Wrangler) with black surround. These tail lamps bear the new “X” form design theme that was inspired by military equipment. A big thing for the all-new Renegade is the open air freedom made possible by two available My Sky open-air roof systems, removable either by hand or with a premium power tilt/slide feature, allowing for a panoramic view that is exclusive to the segment. Drivers looking for best-in-class off-road capability will be interested in the Trailhawk edition for the Renegade, which includes, among other distinctions, exclusive colors for the exterior and the interior, skid plates, aggressive tires, Neutral Gray Satin Gloss exterior accents, signature red front tow hooks, and more. Drivers can choose among ten exterior colors for the 2015 Renegade. These colors include Alpine White Clear Coat, Anvil Clear Coat, Black Clear Coat, Colorado Red Clear Coat, Commando Clear Coat, Glacier Metallic Clear Coat, Mojave Sand Clear Coat, Omaha Clear Coat, Sierra Blue Clear Coat, and Solar Yellow Clear Coat. 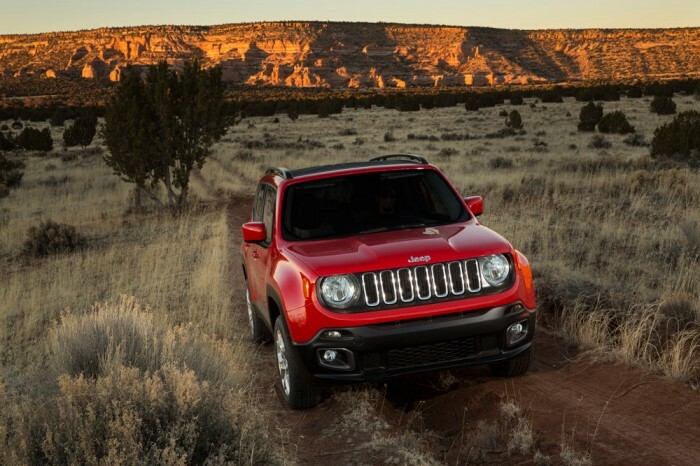 Jeep describes the Renegade interior as “rugged and energetic” and promises that it builds upon Jeep’s heritage. 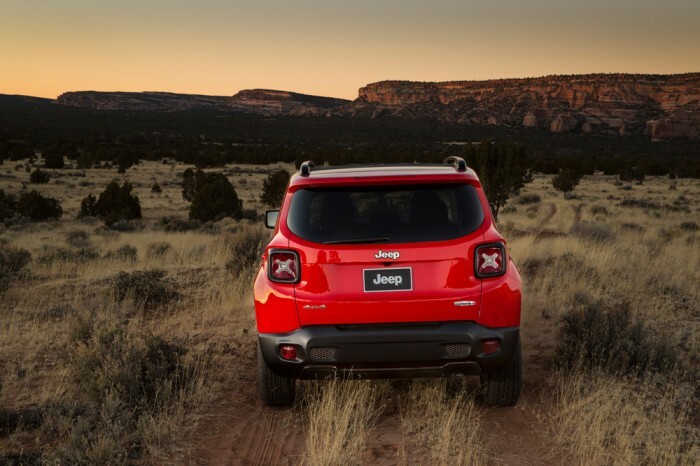 The 2015 Jeep Renegade design team was led by four guiding principles: making an impact that is emotional, using high-quality materials that have an inspired color and materials story, integrating the latest technologies, and developing an intelligent use of space and storage. 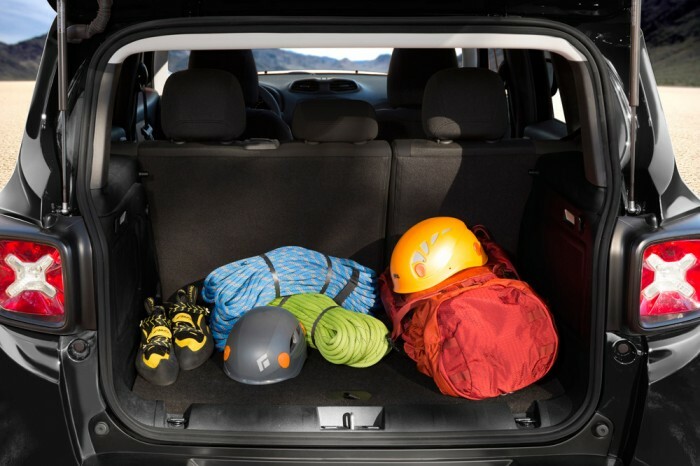 The Renegade interior features 18.5 cubic feet of storage—or 50.8 cubic feet when the rear seats are folded flat.